The FIAT 500L Trekking proves that loving the outdoors doesn’t mean giving up your love for adventurous design and style. Roomy enough for up to 5 adults, it offers a unique exterior design that stands out in the crowd, plus all the comfort and amenities that make a road trip one for the history books. Reach your destination in style in the distinctive FIAT 500L Trekking. Its distinct sensibility is reflected in bold styling like its satin chrome accents, body side moulding and exterior mirrors, while standard fog lamps, a widened stance and unique 17-inch aluminum wheels get noticed in a crowd. 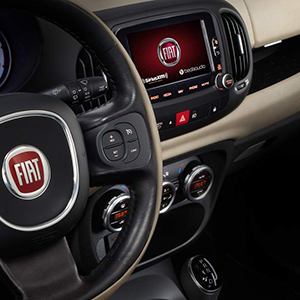 The FIAT 500L Trekking offers exceptional comfort and amenities that will make every cruise a pleasure. The richly-appointed interior features heated cloth seats with unique 2-tone accents and 4-way power lumbar adjust for driver. Standard features also include a leather-wrapped steering wheel with integrated audio controls, leather-wrapped shift knob and dual-zone Automatic Temperature Control. 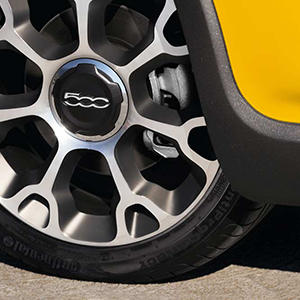 Cruise to uncharted destinations in style on unique and bold 7-spoke 17-inch aluminum wheels. With plenty of options including a roof in black, white or body colour, and many customization options to choose from, the look of your FIAT 500L Trekking can be fully tailored to reflect your own unique personality. The optional Euro Twin Clutch automatic transmission gives you the best of both worlds, with precise automatic driver-controlled shifting for fun and responsive performance. The available Park-Sense® Rear Park Assist System14 and ParkView® Rear Back-up Camera14 help make parking your FIAT 500L Trekking a breeze. ParkView provides a wide-angle view of the area behind the vehicle on the UconnectTM screen with dynamic gridlines to guide you, while Park-Sense alerts you with an audible warning when it detects an obstacle in your path. TAKE THE 2013 FIAT 500L TREKKING FOR A SPIN!